Home » Uncategorized » Buy Gulf Keystone Petroleum #GKP says VectorVest. The stock value has doubled since their last note in March and continues to offer a decent investment proposition to investors with an appetite for risk. 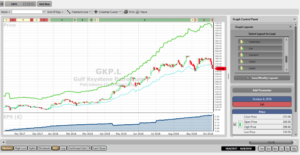 Buy Gulf Keystone Petroleum #GKP says VectorVest. The stock value has doubled since their last note in March and continues to offer a decent investment proposition to investors with an appetite for risk. By Harry Dacres-Dixon in Uncategorized, VectorVest on 10th October 2018 . On Sept 10th 2018, GKP announced its results for the half-year ended 30 June 2018. The Company said operations in the Kurdistan Region of Iraq remained safe and secure throughout H1 2018 with plant uptime at Production Facility 1 and Facility 2 of over 99% during H1 2018. The Shaikan field achieved gross average production of 31,861 bopd for H1 2018 and 31,399 bopd for July and August. Full year guidance remains unchanged at 27,000-32,000 bopd. As a result, GKP announced a record profit after tax of $26.7m (H1 2017: profit after tax of $0.7m). Continued disciplined cost control with underlying cash operating costs remain stable at $14.1m, and GKP has continued to receive regular oil sales payments since 1 Sept 2015, with cash receipts of $107m net to GKP during the half year and $147m net during the eight months to 31 Aug 2018. Net cash generated in operating activities doubled to $61.2m (H1 2017: $30.1m), and GKP recorded a cash balance of $219m at 30 June 2018 and $240m at 7 Sept 2018 against $100m debt principal following debt refinancing in July 2018. With construction work underway, GKP remains on track to increase production at Shaikan to 55,000 bopd in the second half of 2019. In March 2018, taking into account the comparatively uncertain geopolitical picture and GKP’s region of operations, a series of positive VectorVest metric indicators were logged and highlighted, along with a buy note. The stock then traded at 130p, went on to hit and pass our then target of 179p, topping out at over 300p during summer 2018. Now trading at 250p, the stock logs an excellent RV (Relative Value) rating of 1.54 (scale of 0.00-2.00), but the uncertain geopolitical picture previously mentioned continues to weigh across the RS (Relative Safety) metric, where GKP scores a fair rating of 1.04 (scale of 0.00 to 2.00), and a poor Relative Timing (RT) (stock price trend) metric of 0.84, (again on a scale of 0.00 to 2.00). Despite this, trading at 250p, brave investors might still want to consider the stock as it is still considerably undervalued against a current VectorVest valuation of 412p per share. 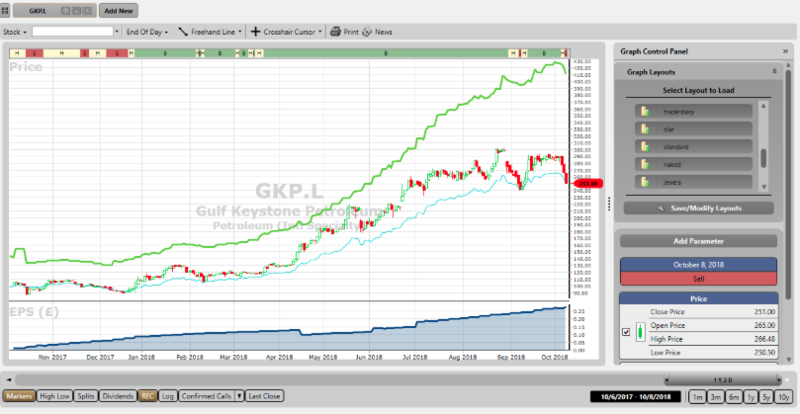 The chart of GKP.L is shown above over the past year using daily candles. The green line study above the price is the VectorVest valuation while the blue line study in the window below the price is earnings per share (EPS). The latter is rising strongly. The share has sold off in recent days with the overall market and traders should wait until the share prints a VectorVest Buy signal before entering or adding to a position. Alternatively, traders should wait and buy a breakout of the 52 week high. Summary: Most investors will have heard of Gulf Keystone Petroleum (GKP) because of some huge historical share price movements and a somewhat chequered history. We outlined the volatile and comparatively risky nature of GKP shares in our March note this year, but those that did take advantage will have seen their investment double in value since that time. The same conditions exist today, although production at Shaikan is increasing, and the company’s financial position has been transformed. VectorVest reiterates the point made in March: as a trading and investing instrument, GKP currently offers a decent proposition, while the excellent RV rating warrants a speculative buy rating for investors with an appetite for risk upon a breakout of the last high made on the last week of August 2018.